tongue swaying among individuals from the different boards of the red chamber. embark on oversight functions aimed at ascertaining the performances of the ministries, departments and agencies of government, especially their implementations of the 2018 budget approved for them by the parliament. Investigations by the correspondent at the red chamber revealed that some chairmen of committees are at loggerheads with their members over alleged benefits from the just-concluded oversight exercise. 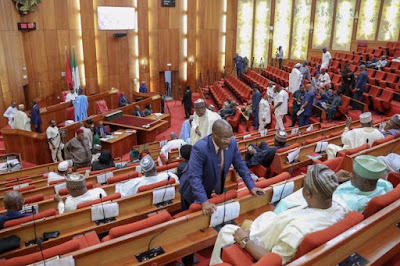 The senator, who spoke with The Punch on condition of anonymity, said the chairmen, in active connivance with their clerks, had been short-changing members of their committees. A member of the committee also told The Punch on condition of anonymity that the 2018 budget of the Army was allegedly increased by N80bn. Confronted with allegations of senators demanding gratifications from MDAs and fighting among themselves over the sharing formular, spokesman for the Senate, Ben Murray-Bruce, challenged any head of the federal government agency to come up with such proof. Deputy Minority Leader, Senator Emmanuel Bwacha, also denied taking bribe. In his denial, Chairman of the Senate Committee on Science and Technology, Senator Ajayi Boroffice, stated that his committee always funds its oversight trips. He however said gifts are accepted based on the discretion of the host.